Below are a few of the testimonials from the 2016 season. “Rafting Outfitter of the Year!” My rafting group (actually, a bunch of middle-aged city-slickers who pretend we are younger than we actually are) has been hitting America’s best whitewater for the past 20 years. To celebrate our 20th year, we rafted the Rogue Wild and Scenic River with Momentum. They were fabulous. (And since our motto is “liberty, fraternity, luxury,” we have high standards. We had rafted with Momentum before, so we had high expectations, but they exceeded even those. We opted for the three day guided Rogue trip with one night camping and one night at the rustic Paradise Lodge (which can only be reached by raft or boat). Everything was perfect. The guides were top-notch. The food was wonderful. (They even made pre-dinner cocktails!) Every detail was attended to. And the river, scenery, and stars were awesome. We most definitely would use Momentum again (and again, and again). Pete (the owner) runs a great outfit, and his staff are second to none. (We were guided by Cooper, Andy, and Mike, by the way. All three were fabulous.) If you are out west and looking for an amazing day or days surrounded by some of the country’s best scenery, give Momentum a call. What a blast! Alan and Anthony were fantastic guides that encouraged us to push our boundaries. We rafted exciting rapids on the raft with our friends and in inflatable Kayaks (scary fun), jumped off high rocks into the river, and swam in river pools that drained into the Rogue. Our guides did not “cheap” us on this trip. They stopped at fun and interesting sites along the way like old homesteads high on a cliff, abandoned miners cabins and waterfalls. Our meals were simply amazing. Yummy and healthy, and even though we were on the riverbank, the food was presented beautifully (cut fruit in neat little rows)! Who takes the time to do this? People who care. “Awesome white water on 2 day trip on the Upper Klamath!” Our family of four including 2 teenage boys fully enjoyed our 2 days on the river. Beautiful views, lots of wild life, serious white water, the best white water we have been on. Our guides took very good care of us and were fun as well. The food was very fresh and good. The camp was unbelievable! Very comfortable. We have rafted the New River in WV, the Yellowstone in MT, and the Colorado in UT, but this was hands down the best rafting trip we have ever done! We will remember this trip always. It was a few days before my husband and I came down to earth; we both felt disoriented…the TV seemed too loud, so many people and cars, even air conditioning felt weird. It was wonderful to unplug and just hang out with wonderful friends for several days. I miss being there and my only regret is I wish it was longer. We had an excellent time on the Rogue River with the Momentum team. Everything was well organized and professional. I can’t speak highly enough about our guides – we were very well cared for during our 4 days and 3 nights through absolutely pristine Wild and Scenic water. The camping accommodations were high quality and everything was set up for us when we got off the water each day. We just had to put our feet up and crack open a beer. The food was insane! I probably should have paddled harder to compensate for all the seconds I ate. I would absolutely recommend without hesitation. “Most Amazing Rafting Trip of my Life!!! !” I experienced the most adventurous 4-day trip of my life. Everything from jumping off rocks, riding kayaks through rapids, stand up paddle boarding; GOURMET MEALS AS THE GUIDES SIMON BEL WERE PROFESSIONALLY TRAINED!!! The guides worked tirelessly for 15 hours a day and did everything to make us comfortable and to have fun. I actually began to feel guilty and wanted to help. There is no better trip and no better company in the Pacific NW. I am going to use them to raft the Salmon next summer!!!! I first went out with Momentum on a 5-day camping trip on the Owyhee River in Oregon, second time with wife and sister on the Rogue River, and this past week with my wife, children and grandchildren on a family trip to celebrate our 50th Anniversary. Pete and his people have consistently and totally pleased me! Even with weather challenges, the guides took care of us like loving parents look after children. And the office staff were nothing short of amazing in helpfulness and patience. There are simply NOT enough words to describe my happiness with Momentum. (Don’t tell Pete, but I would have paid a lot more for the trips–especially the last one with family–than I did.) We were always kept safe and well educated, but exposed to all the fun we wanted. Guides even let my son and my eldest granddaughter work the oars–and advised her on river guiding as a potential college summer job. Somehow, they even managed to feed us all well, even with serious diet and not so serious picky-picky issues. And the lodge stays were wonderful, from an indoor campout experience to a full bed and breakfast experience. If you ever wanted to do white water rafting – take the 1 day rafting trip with Andy at Momentum! This heart pumping, adrenaline ride will kick you off your bucket list! … We are now thinking about a multi-day trip with Momentum! Great outfit with fantastic guides and drivers who love what they’re doing and it shows! Thank you for a wonderful day on the river! A virtually perfect adventure. My wife was not eager for this but she hopped out of the raft and into a kayak before I did. Our guide Jessica was spectacular: always cheerful and supportive, always careful for our safety. Amazingly good food on the river. And of course that glorious Rogue River: spectacular scenery, not too challenging Rapids and great companions. “Great day to be alive!” Went on upper Klamath all day rafting trip with Tyler at Momentum. It was a great day on the water. I worked hard, ate lots and experienced the pure joy of living life fully and checking off rafting on my dream list. I am a veteran of over 100 whitewater river rafting/kayaking trips world-wide and I must tell you that absolutely the best outfitter I have experienced is Momentum River Expeditions. From the guide (Arden) to the shuttle driver (Alan) to the food (snack before the trip, lunch part-way down the river, snack at the take-out), to the equipment they use to the river rapids (in my view many long Class IV and one Class V- rapids), this trip was awesome! Not only do I wholeheartedly endorse Momentum for the Upper Klamath but I will book them for trips on the Scott and Cal Salmon also. You would be wise to go with this outfitter! We just finished a 3 day kayak trip on the Clear Creek and Klamath Rivers. From the very start, our experience was nothing short of outstanding. River guides and camp staff (Tyler, Jessica, and Sam) were highly experienced, helpful, friendly, and truly went above & beyond to make every aspect of the trip enjoyable. They made it seem effortless, though they were guiding, setting up or taking down camp, cooking, feeding, and simply hanging out with us from morning till night. Food was “fit for foodies” — hot, delicious and plenty of it. Camp was set up at each site when we arrived with consideration to the comfort and convenience of the campers. They kept us safe, but also made sure we had a great time. Highly recommended, and would go with Momentum again in a heartbeat. 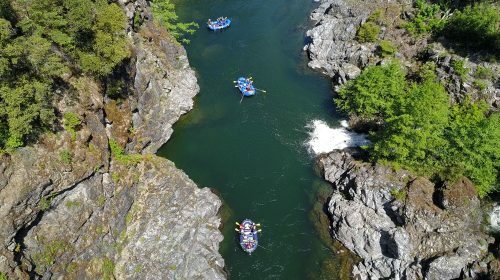 Went on a three day river rafting trip on the Rogue river with Momentum. Can not say enough great things about the trip and the company. We had 21 people in our group ranging from 7 year olds, to 70+ year olds. We camped the first day, and stayed in a Lodge (Paradise Inn) the second night. Our guides were Sammy, Eric and Andy while Sam and Mike carried out stuff and went ahead to set up camp. All 5 guides were phenomenal. Very knowledgeable about the river, but also great to hang out with in the evening and get to know. Sammy was great with the kids, Eric kept us safe and told us about all the history, and Andy provided a calm boat for those that wanted a smooth ride with minimal splashing. And Andy was so helpful and patient for our older couple that needed help in and out of the boats. We took turns in inflatable kayaks and never got sick of the river. The most unexpected part was the amazing fresh fruits and veggies for all meals, homemade hummus and chilaquiles for breakfast! All of us were so sad to see the trip end. I would recommend Momentum to any and every one and am sure I would be disappointed if I tried any other company in the future. We never met Pete, but it was clear he was behind all the decisions, most importantly the choice of guides and food menu. He runs a top notch company!! Thank you Momentum! We just had the most wonderful 50th anniversary water trip with our children and grandchildren! However, I wanted to convey my very strong feelings personally to you – and ask that you convey this on to the others. Beth was amazingly quick with help and helpful information, and so very patient with and responsive to a year’s worth of questions and changes. (Gee, guess you are not missed that much at the office!) If you can’t give her a raise, maybe nominate her for sainthood? Andy, Eric and Robyn were just wonderful at all times, and somehow managed to feed (with happy results) 10 people with diet or “picky-picky” issues… I have and will continue to sing your praises, and send friends your way. May your future be only manageable water and easy riding. Thank you. The trip was exceptional. Andy is a true talent. He was well-respected as the leader. The team did a great job. I’ve been rafting for 25 years and this was the best team and experience I’ve ever had. You are welcome and THANK YOU all on behalf of my “crew” for an awesome Owyhee River trip. The food, the guide support, the instruction, and the scenery were truly spectacular and beyond our expectations!!!!! We have enjoyed many paddling trips together over the past 35+ years but this one ranks up there with the best! Thank YOU! YOU were great, as was the whole team… The cushion surf on the prow of Whistleing Bird (sp? ), in combination with the stuffed French toast and the Mole Oatmeal with Chorizo and Poached Eggs, what a combination. You were wonderful. To Lorenzo and his tremendous skill at everything he does, Ben’s amazing attention to detail, and gift for teaching, Keith’s Sherpa kayak skills, combined with his amazing generosity and humanity, and to my man Andy, who set my tent up at every camp, worked every moment of the trip, and solo boated everything to secure our camp each day, thank you all for a great time. I look forward to my next Momentum trip. I can’t say enough about my recent trip with Momentum on the Illinois, it was an adventure in the truest sense of the word. We caught heavy rain at our first campsite (Pine Creek) which spiked the river flow; we basically waited 2 days for the flow to normalize before proceeding into the class IV section. Cooper and Andy were fabulous, hard-working guides with big hearts and a strong commitment to maximizing the experience for the guests. Early in the trip, I had commented that my wife collects stones from various places we’ve been. Andy remembered that and gave me a cool one to bring back home to my wife at the end of the trip. I was shocked – who does that sort of thing these days? The Klondike Creek campground was like paradise; I did not want to leave! This was not my first trip with Momentum, so I know how good the food is. But this was my first multi-day, and I was astonished how good and varied the food was over the 4 days. I have traveled a ton and have had a multitude of outdoor experiences. In my experience, Momentum provides exceptional service. I would highly recommend Momentum to family and friends, and am eager for my next multi-day with you, perhaps the Cal Salmon. Pete, although I filled out your survey form following our trip, my husband and I want to personally thank you for a great trip. What really made the trip special was lead guide, Andy. He greeted us the moment we stepped out of our car at the put-in and from that point on he provided calm, mature leadership throughout the trip. Andy worked non-stop to make sure the group had everything we needed even when the weather was harsh. You should rest assured that your guests are well taken care of with Andy. We only wish you could do more raft supported kayak trips with your staff and the DeRiemer. And thank you Pete for providing an opportunity for us to explore an absolutely beautiful place in comfort. We appreciate the logistic challenges you face when planning this trip. Hi Pete- Amy and I are still high from our trip with down the Middle Owyhee! Being from Alaska we were wondering what the wilderness experience would be like and it was blow out magical. The portage was something out of some ultimate challenge obstacle course and you all made it look like you do it every day. I would also like to thank you for your careful approach to safety without compromising any fun or sense of adventure. Cool, calm, man of few words, but just enough, Pete, you could also be a floatplane pilot! This has to have been the best trip ever! I have been on guided hunting trips, climbs and rafting trips and nothing compares with Momentum. Our guide Tyler was very skilled and instilled confidence in his paddlers. He did not skirt around any white water, we hit it all. And he is an excellent bar tender and cook as well, along with Pete the owner. The camp, the food the equipment and the white water were everything one could hope for. Thanks so much for a wonderful experience. Hope to see you soon. 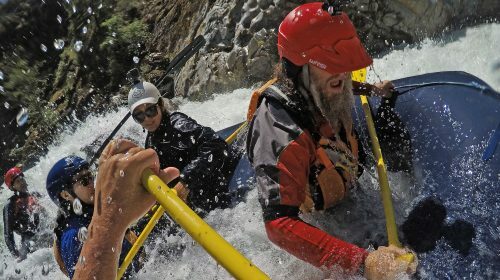 We just returned from an epic 4 day Momentum rafting trip down the Illinois river. This was a fantastic experience and an incredible bargain based on all we got for our money. We were led by 2 awesome guides who made us feel pampered even though we were in the middle of a wilderness area. Cooper is a natural leader with a charismatic personality combined with outstanding technical skills. He was a wealth of knowledge about the natural history of the area and was also a great teacher of rafting and paddling technique. Andy is a perfect southern gentlemen who is so strong he should be on the cover of a box of Wheaties. I had complete confidence in these 2 fine young men who kept us safe and made this one of my favorite trips ever. We are already planning our next Momentum trip. WTG Andy and Cooper! Ron and I have been on over 25 trips over the last 40 years by far the BEST TRIP, the most enjoyable, keep up the great work. What could we do to make the trip better? Bring a grand piano? Actually, I can’t imagine what you could improve.